The traditional approach for empirical scaling of the amplitudes of strong earthquake ground motion revolves around the linear representation of the amplification of seismic waves when they propagate through soft surface sediments and soil. However, in the near field, when the amplitudes of shaking become large, the soil experiences nonlinear strains, and tensile cracks, fissures, and pounding zones form, resulting in highly nonlinear response characteristics. This means that the characteristic site response, and the patterns of amplifications measured via small earthquake records, or by analysis of microtremors, will disappear, departing from the linear amplification characteristics completely. This leads to chaos and creates a problem for seismic zoning because the nonlinear response is strongly dependent upon the amplitudes and on the time history of shaking, so that it becomes virtually impossible to predict the distribution of amplification from the local site conditions. If we assume that the observed damage distribution is a useful indication of the distribution and of the nature of shaking amplitudes, we can conduct a full-scale experiment every time a moderate or large earthquake leads to some damage. Analyses of these patterns, combined with detailed maps of the properties of the soil and of surface geology, suggest that there are reappearing patterns of nonlinear site response from one earthquake to the next. We show one such example for two earthquakes in the Los Angeles metropolitan area. This example implies that the relative movement along the boundaries of the blocks of soil, and along the cracks formed by previous strong shaking, may recur during future earthquakes. 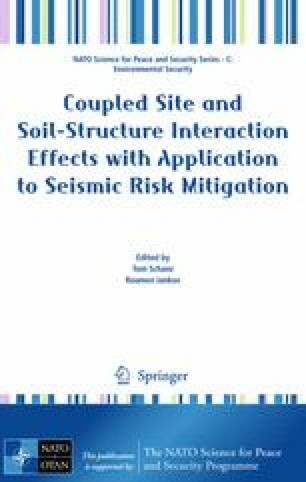 The implication is significant for all engineering analyses of response and for engineering design in the near field because it means that in the vicinity of these cracks the complexity of strong shaking is further increased by large differential motions and by large transient and permanent strains and tilts.